One of our favorite accessories. Clean lines, neat stitching and durable giraffe print faux leather make this tote a sophisticated must-have for everyday use. This convertible bag can be worn as a bucket bag or as a tote! This extra large bag features a glamorous and intricate Giraffe pattern. Luxurious composition of a faux leather design contrasts with luxurious matching trim and handles. This wonderfully textured bag is the hottest this season! Classic colors go with any outfit! This beautiful giraffe print handbag is perfect a for your daily travels, or for a night on the own. 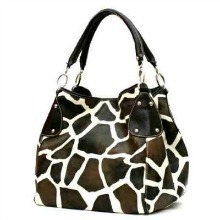 Material: Giraffe Print Faux Leather. Featuring main center zippered compartment capable of storing all essential accessories like cosmetics, sunglasses, with one wall zippered pocket inside, one slip pocket and one cell phone pouch. Featuring matching color handles and trim with Silver Tone Hardware – Chrome Side Rings attached on the edge of the handles for sturdiness.